Secure document shredding and disposal is a must for today’s business and personal information. Sensitive business matters must be safely stored while needed, and safely disposed of for your security. Securely destroying confidential information reduces your liability significantly and protects proprietary consumer or company information. Whether you have overflowing filing cabinets or you are relocating your office, the only method of guaranteed security is through professional document shredding. Shredding in-house with an office shredder does not provide an effective means of destruction; not only are documents often missed, but there is no tracking system in place to record what information was shredded and when it was completed. Additionally, a standard office shredder can only accept so many sheets of paper before it jams and/or breaks down, leaving you with unnecessary hassles and expenses. Outsourcing your document shredding needs to an experienced company will allow you to focus on more productive tasks, saving your organization money and time. Augusta Data Storage provides outstanding document shredding services that are 100% dependable, secure, and trusted by many businesses in the C.S.R.A. From small offices to industry giants, we offer unique destruction services that can be customized to your specific budget and collection needs. Why Augusta Data Storage for Your Secure Document Shredding? From on-site document shredding to off-site shredding, our team of professionals is fully trained and background checked to provide a highly secure chain of custody throughout the shred process, ensuring to meet and exceed industry standards and regulatory requirements set in place through FACTA, HIPAA, and The Gramm-Leach-Bliley Act. Augusta Data Storage has been certified by NAID (National Association for Information Destruction) since 2009. Certification is endorsed for Mobile & Plant based paper records destruction. • Information is Obsolete – When you choose to partner with Augusta Data Storage, you are ensuring that each document is shredded into tiny irrecoverable pieces. Particles of paper from your business are mixed in with those of a wide variety of other documents from other companies, making the recovery of confidential details impossible. • Compliance Practices – When you hire our team for your shredding services, you can rest assured that your organization will maintain compliance with state and federal privacy laws. Laws in the United States require document destruction policies to be in place in any business handling sensitive information. The lack of a policy, or adherence to proper disposal processes for sensitive material may result in penalties and fines. • Protect Your Reputation – If your company was to experience a data breach, how would your customers respond? Even the smallest of data breaches can have significant consequences, especially when it comes to your reputation, something you have worked so hard to earn. Secure document shredding protects your good reputation. 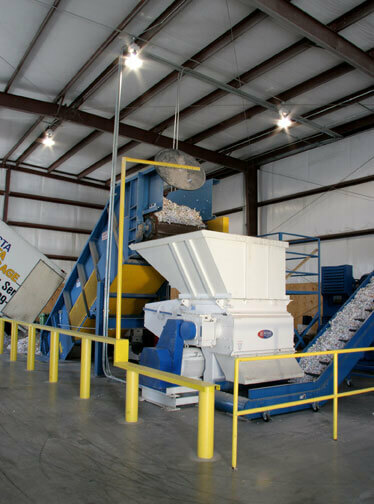 • Convenient – Hiring a reputable document shredding company like Augusta Data Storage is as simple as picking up the phone and making a single call, or arranging a scheduled service to take place on pre-determined dates, with little disruption in your day. Secure document collection containers provide for daily disposal of secure documents until pick up dates are scheduled. Get a quote, leave a review or simply ask us a question. We respond within 24 hours. What happens to your shredded documents? Augusta Data Storage, Inc. has been serving customers throughout the CSRA with customized solutions for records management for over a decade. Augusta Data Storage, Inc. , Augusta, Georgia. All rights reserved.